Mermaid Beach ALP candidate Gary Pead has made a complaint to police that sitting LNP MP Ray Stevens assaulted him after his infamous "chicken dance" interview last week. During that infamous interview, which he apparently did not realise was being filmed, a mute Stevens attempted to mock and intimidate this author through a series of hand gestures and gyrations. 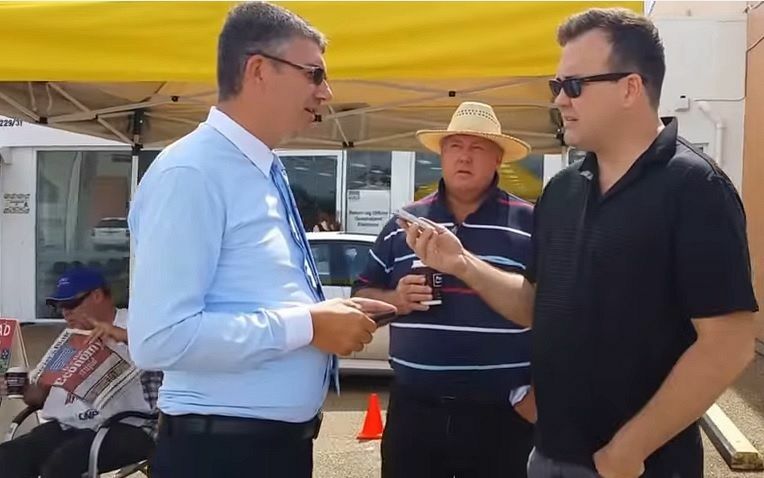 But it is after the interview that Stevens is said to have been at his most threatening, allegedly angrily confronting both Mr Pead and the Palmer United Party volunteer who filmed the incident, James Gallavin, outside the polling booth. Ironically, Ray Stevens and the LNP are campaigning heavily locally, and around the state, on law and order issues. On Wednesday 21st Januart 2015 at 9.20am outside the temporary Pre-polling booth at 2229 Gold Coast Highway, Nobbys [sic] Beach. I witnessed and was involved in three incidents of aggravating threatening language, threatening behaviour, and assault by Ray Stevens on the persons of Dave Donavan [sic] (a journalist with Independent Australia) myself and James Galivin [sic] (a young booth worker for the Palmer United Party). James Galivin [sic] was physically body charged with about six quick steps, to well within an acceptable personal spoace distance, while being verbally threatened with this language, "If that goes on Utube [sic] I will come and get you, you will be hearing from me, that better not go on Utube [sic] you'll be hearing from me" causing James to quickly retreat and immediately leave the polling booth in fear and upset. The incident with Mr. Donavan [sic] was captured on video but not the more threatening incident with Mr. Galivin [sic]. James Gallavin has confirmed to IA Gary Pead's account, adding that Mr Stevens allegedly reinforced his threat as Gallavin walked away, saying: "I mean it!". Despite saying he felt shaken by My Steven's "ominous" statement, viral video maker James Gallavin ignored Mr Stevens' alleged threat. He has also declined to make a complaint to police over the incident. "I then challenged Stevens verbally from a distance of about three meters [sic] saying "cut that out Stevens. You can't go about threatening people like that". Stevens then assaulted me with an aggressive body charge of three or four quick steps toward me pushing his face within two inches of mine. His mouth was foaming and spittle was flying from his mouth into my face while he was saying "what f-----g business is it of yours" causing me to step back in fear of further attack. The incident involving me was witnessed by Mr. Alex Caraco." It should be noted that in Queensland, actual physical contact is not necessary for assault to be proved, merely that a person felt genuinely physically threatened. Independent Australia journalist David Donovan, the reporter in the viral video, said he had not felt threatened by Mr Stevens, who he said was “just being a goose”. “Technically, if I really wanted to pursue (an assault charge) I could — but I wouldn’t,” he said. In further embarrassment to Mr Stevens, opponents of the controversial cableway have mirthfully taken to dressing up as chickens to protest against Mr Stevens involvement in the project outside the Nobby Beach pre-polling booth in which the incident occurred. Ray Stevens holds the Mermaid Beach seat with a margin of 26 per cent. He has been contacted for comment about Mr Pead's complaint but has so far not responded.